New album Alchemy -what are people saying!? 'Sublime delivery... go and see him' BBC Radio 2 Cerys Matthews (4th March 2019). by this acclaimed singer, songwriter and guitar player. Choice of music is always a measure of a musician’s true worth when they create an album comprising other people’s songs – and ‘Silver Collection’, Mike’s new CD of his favourite songs from across the musical pantheon, demonstrates an outstandingly bold and thoughtful choice; it also showcases superb musicianship and an extraordinary ability to awaken something fresh, original and new in each of the album’s superbly crafted 14 songs. 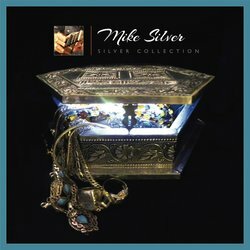 Spanning traditional ballads, epic jazz and blues, as well as classics by some of Silver’s favourite songwriters from the UK and USA, ‘Silver Collection’ is a beautiful, sensitive and richly rewarding album that transforms familiar songs into newly made, magical and wonderful music. How Many Rivers - £12.95 (inc p&pkg).